Rocket Matter Knowledge Base LawToolBox - Court Rule CalendaringHow to activate your LawToolBox subscription. 1. Navigate to your 'Settings'. Note, you must have administrative settings to view this page. 2. Under 'Court Rules' select 'Settings'. 3. Select the desired jurisdictions you want available when adding court rules to matters. You may also choose the default jurisdiction to avoid repetitive steps. Hint: When you start typing to search for jurisdictions, start with the state code in capital letters. Examples, FL, CA or NY. 4. Activate your court rules license by clicking to 'Activate & accept license agreement' and 'save settings'. By activating this feature, you're agreeing to pay an upfront monthly recurring charge of each user on the account. Click here to view the license agreement for LawToolBox. *To see full pricing and a demonstration of how Rocket Matter integrates LawToolBox, please click here. 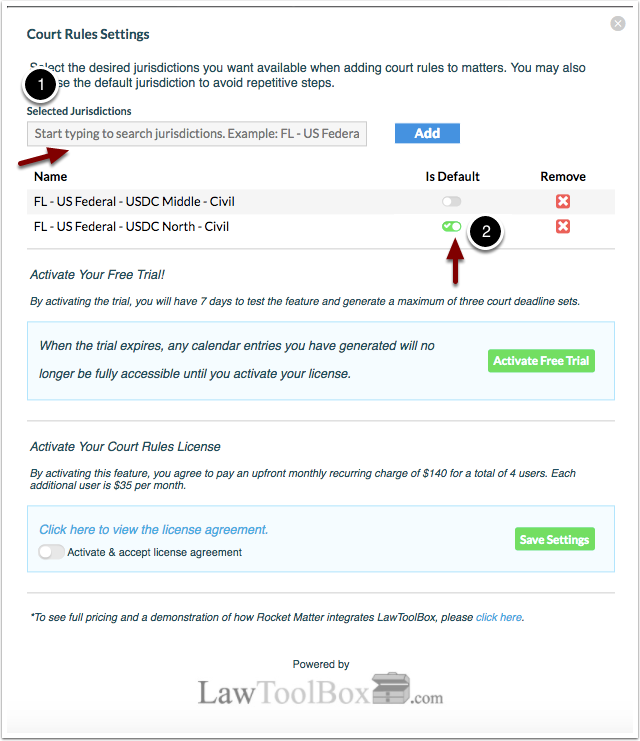 Prev: How to add/remove my jurisdiction for court rules and set default jurisdiction for LawToolBox. Next: How to activate your free trial for your account.